Oh my goodness, this is so fantastic, Catherine! Love your paper piecing, scalloped shape- really everything is perfection! I want it all! LOL! Thanks so much for sharing this darling card with us at The Card Concept! What a sweet idea - Love the 'bib' with the scalloped edge! So glad you joined us at The Card Concept! Love this bib card idea. Colors are fabulous too. I think I will pin you. Thanks. Love your little bib card with th polka dot pram. How fun! How cute is this card? I love that you made it into a bib with that adorable image!! Great job on the challenge!! Oh...i love this one!! 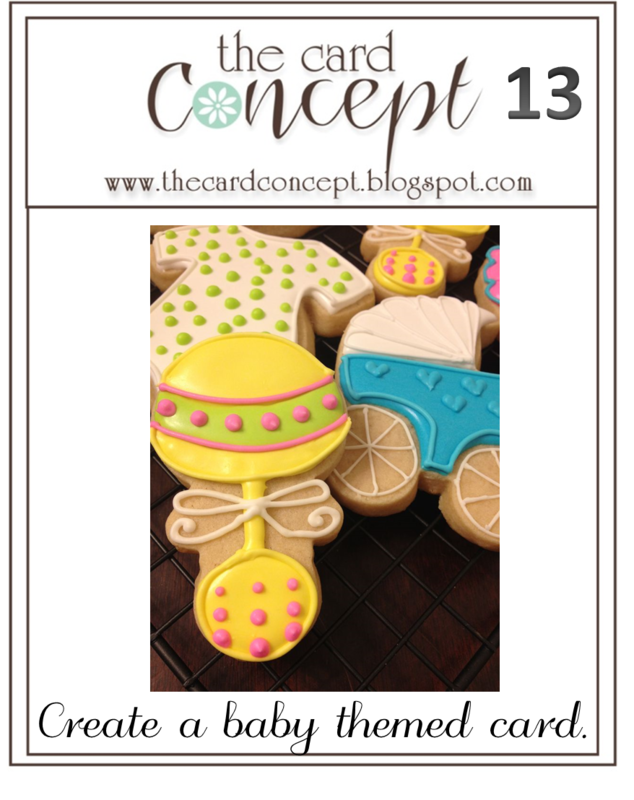 Love the shape of this card and the pretty pram!! Thank you for joining us at The Card Concept!! A wonderful baby card - love the shape as well as the colors. Such a sweet card! Love the bib shape! Oh, this card just makes me smile. I love the paper piecing on the pram. The bib is genius!